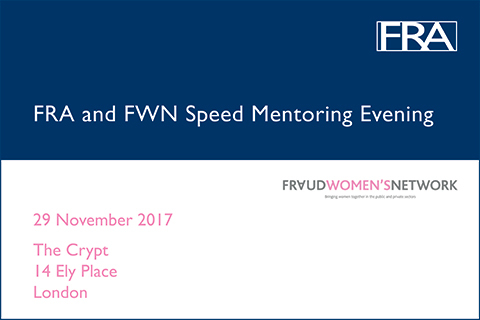 As a sponsor of Fraud Women’s Network, on 29 November 2017, FRA is hosting a Speed Mentoring Evening exclusively for FWN members. Each attendee will get the opportunity to have a five minute one-to-one with five mentors – all of whom are at the top of their field within the fraud industry and are ready to answer any questions you may have regarding your career. One of FRA’s founding partners, Frances McLeod, will be attending as a mentor. FWN and FRA have carefully selected 11 mentors who have extensive experience within all areas of the fraud industry including law enforcement, the public sector, banking, law, finance/accountancy and the commercial world. The event is being held at The Crypt, Ely Place, London. Visit the FWN’s website to book your place.